The art and design objects and materials in The Wolfsonian–FIU collection played a major role in shaping the world between 1850 and 1945, having effects still felt in our lives today. These ongoing economic, social, technological, and political stories are still being written and exponentially amplified through the processes of mass media and digital technology in almost every moment of our personal and public lives. That is the ecology in which our youth are born and mature, offering new opportunities for participation in democracy and a new array of challenges to freedom of expression. Teen Thoughts on Democracy provides opportunities to explore what they think about freedom today. Although access to the internet and the affordances of websites and online materials have been built into this curriculum, the teaching approach does not focus on digital media learning solely; but, instead, it offers a blended teaching and learning experience utilizing both old and new technologies. The lesson resources include traditional print materials and those available through a rich array of websites educators may access in the classroom or school media lab. Although the lessons can be taught using traditional teaching methods, using new media is a very effective way to engage teens (ages 12-18) in exploring freedom of expression and the ways in which it is often threatened—through intolerance and intimidation, media manipulation and “spin,” censorship and disinformation, and the common strategies of persuasion used in propaganda—especially through new digital media platforms. In the curriculum, students play card and board games; read and research primary source materials, literature, trial testimonies, personal narratives, and more; watch and listen to films, music, and other interactive media; as well as conduct debates, analyze and create visual messages, and present their opinions as they explore issues reflected in historical and current events. The goal of these diverse activities is to engage and immerse teens in personal experience around topics they often find boring and not relevant to their lives. Open discussion and active inquiry are also threaded throughout the lessons in order to foster civic literacy, verbal and visual literacy, and increased awareness of the complex relationship and interplay between governing bodies, citizens, and the mediums of expression. As the Wolfsonian’s collection of propaganda shows, public policy and society can be shaped according to how a citizenry responds to powerful visual messages. Teen Thoughts on Democracy provides youth with some of the tools they will need as adults to be informed and responsible members of society. 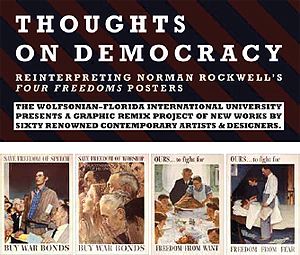 This curriculum is built on the popular response to The Wolfsonian’s Thoughts on Democracy exhibition, which sought to bridge the gap between graphic design expressions from 1943 and 2008. Fifty-five leading contemporary artists and designers were invited to create new graphic designs inspired by American illustrator Norman Rockwell’s Four Freedoms posters. Rockwell’s posters, which were reproduced for mass dissemination by the U.S. Office of War Information, communicated President Franklin D. Roosevelt’s vision of “a world founded upon four essential human freedoms”—Freedom of Speech, Freedom of Worship, Freedom from Want, and Freedom from Fear. What has become known as FDR’s “Four Freedoms Speech” was actually his Third Annual Message to Congress on the State of the Union delivered in 1941. Teen Thoughts on Democracy was developed by a team of museum educators at The Wolfsonian–Florida International University, a museum of art and design located in Miami Beach, in partnership with seasoned language arts, social studies, and art educators from Miami-Dade County Public Schools. The design of the games took place over a year’s time with each of the final four games being prototyped and tested by teens in the museum or in the classroom. They all were redesigned and retested multiple times to evaluate the game mechanics, graphics, game elements, and student enjoyment. A number of games were abandoned in the process. The students from iPrep Academy (and other high schools), as well as teens taking part in The Wolfsonian’s Comic Kraze cartooning workshops, learned about game design and provided important feedback on how each game worked, whether it was fun or engaging, how it might be improved, and their personal experience or feelings while playing. Graphic designers and website developers also played vital roles in branding the project and games, as well as, designing the printed Instructor Guide and this website.